I think I can send you a PDF of the parts manual. There's a link on this site -- somewhere -- to the 1988 electrical manual. There are very few changes from '87 to '88, so that should take care of 95% of your electrical needs. I'm afraid I can't help with the service manual, though. Can't send parts manual. File is too big -- I tried two different e-mail services. I have the shop manual for the 1988 XJ, which would cover a large part of what is the MJ. Could these big files be put in a google drive possibly? I know we have a google drive test bank that has tons of notes, tests, and book solutions in it. The issue about the 87 manual is that it is the 86 manual with supplements for the 87 changes. I find myself using Vol 2 mostly for the 4.0. Off Ebay several years ago I purchased an 87 Electric manual. It is very similar to the 88 manual that jpdrive1 linked to. However, there are some differences between 87 and 88. I found that while tracing wires on my MJ (production date May 1987). The 87 wiring diagram showed me one thing; my actual wiring showed me something different. My actual wiring did match the 88 manual's diagram. it might be a duplicate to the one above, but there's a link to an 88 manual in the link in my signature. I assume you tried compressed? Google Drive would be the next best bet. It would be convenient since the link just needs to be shared and anyone can access it without needed to have it personally emailed to them. Would be cool to have a Google drive with tons of electrical diagrams, manuals, ECT. That we all have access to. Basically a test bank for jeep manuals and diagrams. I didn't try compressed, I was too tired to think of that. I'll see if I can remember how to use 7-Zip. As to Google Drive -- first, I don't even know what that is so I obviously don't know how to use it. Second, the publication is, I believe, copyrighted, and I don't think I care to tempt fate by putting a copyrighted publication out there for the world to see. [Edit] No joy. The compressed file is still to large to send as an e-mail attachment. Dang that must be a big file. As for Google Drive, it's just an online cloud storage service. If you go to the website and login with your Google account or create one, you can upload the file and then share it with certain people. At that point it would only be available to the people you choose and avoid copyright issues. You can then remove their access after they get what they need. This is a valuable resource to keep bookmarked. I finally got this to go. I don't know where I found it but had been opened to many times to count on my phone. 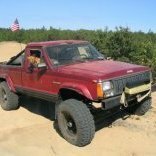 The xjjeep site is awesome! 37,009 KB uncompressed, 29,014 KB compressed. Ah, but that would require having a Google account. Google is part of the evil empire, and I choose not to participate. I don't need them keeping track of everything I do online. Interesting, and I suppose better than nothing ... but basically a lie. There is no 1984-1993 Cherokee factory service manual. That's a scan of the Motor Manual, which is (or was) an independent, aftermarket publisher of service manuals, similar to Chilton's. I used to buy a new Motor Manual every other year back in my AMC days, but they became increasingly expensive while becoming increasingly less accurate in their information, so I finally had to give up. The 1997 FSM does, however, appear to be a scan of an actual factory manual. For the benefit of Comanchejeepgal, go to that link and download the 1988-1990 parts catalog. There are few differences between a 1987 and a 1988 Comanche, and looking through some of the parts listings it appears that this catalog covers 1987, despite the title. Yeah, I think the title is a typo. The first sentence at the top of the first page of the "88-90" parts manual is: "This publication contains Parts Information for all 1987-90 JEEPS".